By the time State Police arrived, the cyclist had left the Thomas P. “Tip” O’Neill Jr. Tunnel. At first, Alex Kerr thought the light coming toward him while he sat in bumper-to-bumper traffic in the I-93 tunnel was part of a work crew. Then, it occurred to him that it might have been an emergency vehicle of some kind. But when it got closer, Kerr, of Dorchester, saw that he was wrong on both counts: It was actually a person riding along the busy expressway on a bicycle from Bluebikes. Kerr said he spotted the woman biking the Thomas P. “Tip” O’Neill Jr. Tunnel around 4:30 p.m. Monday, as he waited to cross the Zakim Bridge toward Somerville. As the cyclist passed by, he got out his smartphone and took several photos, in disbelief. Worried about the woman’s safety, Kerr called Boston police, who directed his call to State Police. Officers told Kerr, 30, that several other drivers had also called to report the cyclist. According to officials at the Massachusetts Department of Transportation, State Police responded but by the time they arrived in the area the cyclist was gone. A video sent to the Globe shows the unidentified woman bicycling on the left shoulder of Interstate 93 in Boston, near mile marker 17.9, with traffic traveling northbound. “The cyclist is seen initially pedaling in the direction of travel, then is out of sight of the camera for about 20 seconds,” officials said. The woman then apparently makes a U-turn, “because after disappearing for about 20 seconds the cyclist is seen biking toward the camera,” or southbound. 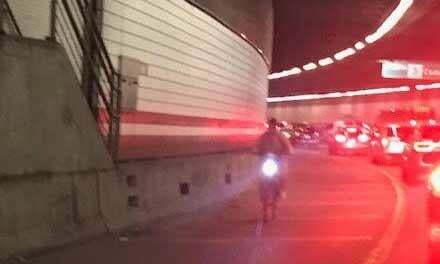 MassDOT’s Highway Operations Center confirmed that the cyclist exited the tunnel safely, officials said. It certainly wasn’t the first time that someone had — mistakenly or not — ended up riding illegally on the highway on a rental bike. In March, a person was captured on video by surveillance cameras riding along the interstate through the same tunnel. That person eventually exited through a stairwell that connects to surface roads, leaving the bike behind. And in 2016, someone was recorded riding a bike from Hubway, Bluebikes’s predecessor — on the northbound side of the O’Neill tunnel.